Few uncontrolled studies done to evaluate the efficacy of topiramate in migraine prophylaxis especially in refractory causes confirmed that it could be effective in prophylaxis of migraine headache. , Data to support the effectiveness, tolerability, and adequate dosage of pediatric topiramate are not well-reported. The present study was planned and performed to evaluate the efficacy of low-dose topiramate in pediatric migraine prophylaxis. A general evaluation and physical examination were performed in the first visit, and patients were asked baseline laboratory screening tests and a migraine checklist, including demographic and clinical details of the patients such as frequency, duration, and intensity of headache was filed for each person. Patients with known case of epilepsy. After simple randomized dividing the patients into two groups, topiramate was started at a dose of greater or lower than 2 mg/kg/day. For the clinical assessment of the patients, to minimize the potential side effects, the dose was slowly increased 0.5 mg/kg/day in the 2 nd week, divided into two daily doses according to patient's response and tolerance. There were three stages of this study such as at the beginning of study (Base-line), period which was 4-weeks after receiving drugs (phase I) and at the end of 8-weeks after receiving drugs (phase II). Headache severity was scored on a 1-3 point scale with one presenting no effect on daily activity, two for partial inhibition of daily activity and three for loss of daily activities based on the Visual Analog Scale (VAS). The response to topiramate treatment was recorded according to the patients and parents' reports during follow-up visits, and was defined as: Complete cessation of headache attacks (excellent response), reduction of headache frequency more than 50% of baseline (good response), reduction of headache frequency less than 50% of baseline (fair response), No response or increase of headache attacks (poor response). The data analysis were performed by statistical package for social sciences version 13. We analyzed number of headaches per month, changes in Body Mass Index (BMI) and dosage before and after treatment according to the presence or absence of adverse effects, using the Student's t test. The incidence of migraine attacks and adverse effects before and after treatment was analyzed using χ2 nonparametric test. Results are expressed as mean (±SD) and P < 0.05 was considered as statistically significant. Before starting the study all the patients were given extensive information on the study nature and methods, and we obtained an informed written consent, and patients were advised that they could withdraw from the study at any stage for any reason. This study was performed in accordance with the declaration of Helsinki and subsequent revision and approved by the Ethics committee at Mazandaran University of Medical Science. Sixty patients who met the inclusion criteria were enrolled in the study. Five of the patients were excluded due to no follow-up, patient's choice or drug intolerance. Ultimately, out of 55 patients who completed the course of study, 30 (54.5%) were girls, and 25 (45.5%) were boys. The mean age was 8 years (range: 6.3-14.5 years). Patients in the two groups were not significantly different regarding age, gender, and other characteristics (P > 0.05). Mean (±SD) numbers of monthly headache frequency at the beginning of the study with topiramate in two groups receiving > 2 mg/kg/day and < 2 mg/kg/day were 6.9 (±2.1) and 6.2 (±2.4), and mean (±SD) duration of each episode of headache at the baseline were 5.2 (±2.4), and 5.4 (±2.1) h, respectively. The mean (±SD) headache intensity at the beginning of the trial was 7.11 (±1.4) and 7.2 (±1.9) and the base line data show that there were no statistically significant differences between the two groups according to base line headache characteristics (P > 0.05). Data about comparison of headache parameters at baseline and after 4 and 8 weeks of treatment are recorded [Table 1]. Frequency intensity and duration of migraine headache decreased significantly between repeated follow-up visits of each patient in the study according to statistical analysis tests [Table 2]. Clinical response was quantified as excellent in 61%, good in 19%, and fair in 13%, with no response in 7% of the patients. Topiramate was well tolerated. No significant reduction in BMI or weight loss occurred during the treatment. The most common side effects of topiramate were paresthesias (five patients), anorexia (four patients), and drowsiness (four patients). Migraine prevalence estimates vary from 1% to 3% at 7 years and 4% to 11% at 7-15 years. ,, Many children with migraines require prophylactic therapy. The successful treatment of pediatric migraine includes an individually tailored regimen of both non pharmacologic and pharmacologic measures. Non-pharmacologic therapies such as abiding by appropriate sleep patterns, diet, stress reduction and exercise may be helpful in preventing headaches. If the patient can identify triggers, such as particular foods or caffeine, avoidance is recommended, if possible. Many treatments are currently used for migraine prophylaxis, including β-blockers, calcium channel antagonists, serotonin antagonists, antidepressants and anti-epileptics. , Topiramate is an antiepileptic drug with established efficacy and safety in older children and adults with epilepsy. , Although, before its approval in August 2004. , Topiramate has been demonstrated to be helpful in adults, few studies have been conducted to establish evaluating topiramate's efficacy, safety, optimal dose, length of treatment, and side effects in childhood migraine. So this present study was designed and performed to compare different dosage of topiramate in pediatric migraine prophylaxis. In our study, the mean dose in patients receiving topiramate (<2 mg/kg/day) was 1.2 ± 0.7 mg/kg/day. (Range: 0.5-2 mg/kg/day) comparing with 2.4 ± 0.5 mg/kg/day in group receiving more than 2 mg/kg/day. The mean dose of topiramate used in several studies varied from 1.7 ± 1 mg/kg/day S.D. to 3.5 ± 1.7 mg/kg/day. ,, However, Winner et al. suggested that possibly topiramate at dose of 50 mg/day, administered prophylactically, may reduce migraines in adolescents but Lewis et al. evaluated the efficacy and safety of topiramate for migraine prevention in pediatric subjects aged 12-17 years. They found that topiramate at 100 mg/day, but not 50 mg/day, resulted in a statistically significant reduction in the monthly migraine attack rate from baseline versus placebo (median, 72.2% vs. 44.4%). Campistol et al. presented that effective mean dose of topiramate in pediatric migraine prophylaxis is 3.5 ± 1.7 mg/kg/day. The results of this study show that though both groups had (<2 mg/kg/day vs. >2 mg/kg/day) decreased monthly headache frequency, intensity and duration. Borzy et al. studied a group of 21 children aged 6-18 years who were diagnosed with chronic daily headaches and treated with topiramate. In this report 62% of families reported that low-dose topiramate (average dose of 30 mg/day) was successful in reducing both the frequency and severity of headache episodes. Campistol et al. presented 24 children treated with topiramate for 4 months. 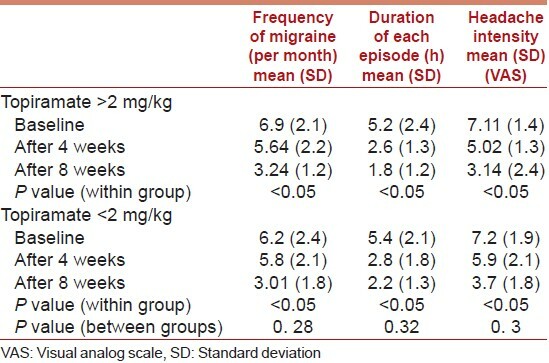 And recorded a reduction in migraine frequency but this was not significantly different from baseline and significant differences in migraine severity and duration of the episodes. Our study revealed that 61% children had an excellent or good response. Cruz et al. reported that 28 (76%) of children with migraine had an excellent or good response to topiramate. Topiramate was well tolerated and adverse effects occurred in 13 (23.6%) of the patients (five with parenthesis, four with drowsiness, and four with anorexia). Patients taking > 2 mg/kg/day were more likely to exhibit side effects: Eight of 13 were taking > 2 mg/kg/day, compared with children taking < 2 mg/kg/day (P = 0.042). There was a direct relationship between dosage and side effects. Another study, evaluating the safety, and tolerability of topiramate show that the most common side effects were paresthesia, weight loss, sleepiness, and worsened headaches. , This study has several limitations. First, it was conducted at a single center with a smaller subject group. Another important fact that questionnaire were recalled from the patient's or parent's memory. Furthermore, larger, prospective studies are required to evaluate the long-term efficacy, tolerability, optimal dose, length of treatment, and long-term effects of topiramate in this population. In conclusion, the results of this study demonstrated that low-dose of topiramate (<2 mg/kg/day) is effective, well-tolerated, safe, and suggested as an alternative prophylactic treatment for pediatric migraine. The authors kindly thank the Mazandaran University of Medical Science for financial support. 1. Barnes N, Millman G, James E. Migraine headache in children. Clin Evid 2006;15:469-75. 2. Ottman R, Hong S, Lipton RB. Validity of family history data on severe headache and migraine. Neurology 1993;43:1954-60. 3. Hershey AD, Winner PK. Pediatric migraine: Recognition and treatment. J Am Osteopath Assoc 2005;105:2S-8. 4. Lewis DW, Scott D, Rendin V. Treatment of pediatric headache. Expert Opin Pharmacother 2002;3:1433-42. 5. Winner P. Overview of pediatric headache. Curr Treat Options Neurol 2004;6:471-87. 6. Ginger CM, April MD, Brandon PB, Bryan LL. Topiramate: Safety and efficacy of its use in the prevention and treatment of migraine. J Cent Nerv Syst Dis 2011;3:155-68. 7. Pietrobon D. Migraine: New molecular mechanisms. Neuroscientist 2005;11:373-86. 8. Faught E. Efficacy of topiramate as adjunctive therapy in refractory partial seizures: United States trial experience. Epilepsia 1997;38:S24-7. 9. Cruz MJ, Valencia I, Legido A, Kothare SV, Khurana DS, Yum S, et al. Efficacy and tolerability of topiramate in pediatric migraine. Pediatr Neurol 2009;41:167-70. 10. Olesen J. The international classification of headache disorders. Rev Neurol (Paris) 2005;161:689-91. 11. Bille BS. Migraine in school children. A study of the incidence and short term prognosis, and a clinical, psychological and encephalographic comparison between children with migraine and matched control. Acta Paediatr Suppl 1962;51:1-151. 12. Sillanpaa M. Prevalence of migraine and other headache in finnish children starting scho. Headache 1976;15:288-90. 13. Mortimer MJ, Kay J, Jaron A. Epidemiology of headache and childhood. Migraine in an urban general practice using ad hoc, valquist and IHS criteria. Dev Med Child Neurol 1992;34:1095-992. 14. Eiland LS. Anticonvulsant use for prophylaxis of the pediatric migraine. J Pediatr Health Care 2007;21:392-5. 15. Lewis D, Diamond S, Scott D, Jones V. Prophylactic treatment of pediatric migraine. Headache 2004;44:230-7. 16. French JA, Kanner AM, Bautista J, Abou-Khalil B, Browne T, Harden CL, et al. Efficacy and tolerability of the new antiepileptic drugs II: Treatment of refractory epilepsy: Report of the Therapeutics and Technology Assessment Subcommittee and Quality Standards Subcommittee of the American Academy of Neurology and the American Epilepsy Society. Neurology 2004;62:1261-73. 17. Valencia I, Fons C, Kothare SV, Khurana DS, Yum S, Hardison HH, et al. Efficacy and tolerability of topiramate in children younger than 2 years old. J Child Neurol 2005;20:667-9. 18. Silberstein SD, Neto W, Schmitt J, Jacobs D. Topiramate in migraine prevention: Results of a large controlled trial. Arch Neurol 2004;61:490-5. 19. Von Seggern RL, Mannix LK, Adelman JU. Efficacy of topiramate in migraine prophylaxis: A retrospective chart analysis. Headache 2002;42:804-9. 20. Winner P, Gendolla A, Stayer C, Wang S, Yuen E, Battisti WP, et al. Topiramate for migraine prevention in adolescents: A pooled analysis of efficacy and safety. Headache 2006;46:1503-10. 21. Lewis D, Winner P, Saper J, Ness S, Polverejan E, Wang S, et al. Randomized, double-blind, placebo-controlled study to evaluate the efficacy and safety of topiramate for migraine prevention in pediatric subjects 12-17 years of age. Pediatrics 2009;123:924-34. 22. Campistol J, Campos J, Casas C, Herranz JL. Topiramate in the prophylactic treatment of migraine in children. J Child Neurol 2005;20:251-3. 23. Borzy JC, Koch TK, Schimschock JR. Effectiveness of topiramate in the treatment of pediatric chronic daily headache. Pediatr Neurol 2005;33:314-6. 24. Pietrobon D. Migraine: New molecular mechanisms. Neuroscientist 2005;4:373-86.